Manufacturing, power production and process industries worldwide, as well as large facilities. User-friendly maintenance and material management system that facilitates maintenance planning and inventory control. 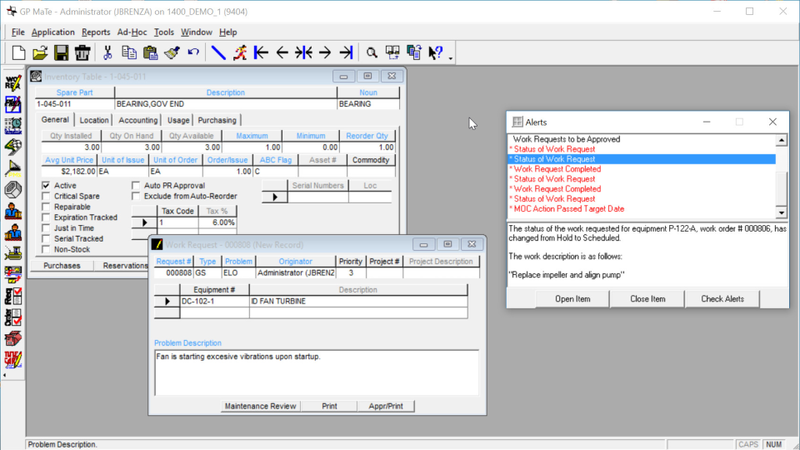 Product has many optional modules that support Safety (PSM, MOC and LOTO), Budgeting, Multi-plant information sharing, and Operator Tours and Data Collection. The system is available in many languages and supports vendor currency conversions. GP MaTe Reviews Recently Reviewed! Cons: Have three separate facilities at one physical location. Would like to switch "Companies" similar to what you would do in QuickBooks. Overall: We have used GP Mate at our Power Plant facilities since the 1980's from his DOS based version up to the current Windows application. It is an excellent tool to not only manage the Maintenance activities, but the Inventory control and Purchasing and Accounts Payable function. This application has excellent reporting capabilities, from the "canned" reports and the added functionality of writing adhoc reports to meet our needs. Recommendations to other buyers: Try it - I think you will be delighted in the results! Al, Thank you for taking the time to share your experiences. Appreciate your comments about being able to better separate your operating units. Perhaps we should discuss our Multi-plant options which were not available when you started using GP MaTe. Power Plant Combined Cycle GP Mate Usage. Overall: GP Mate software is suitable for a small company application that operates stably in Operation and Maintenance. It strongly supports for maintenance management through the work order, spare part, purchasing modules. Another budget, personnel and accounting modules are used for reference. Pros: User friendly, easy reports creation. Cons: sometimes access was a problem. Overall: I found the software useful, versatile, user friendly, flexible, could elaborate different reports. In general helped me a lot as Materials Manager for Tacoa Power Barges in Venezuela. Cons: search engine for vendor ID's. Overall: I use the software everyday. I am in the Purchasing dept., so we use it to procure and search previous orders and worker orders. It is very important to have a software that can search easy and quickly. I usually have someone over my shoulder waiting for me to research a previous purchase order to see when we purchased it and what piece of equipment it is tied to. Search capabilities are very important for us to find info quickly. Finding vendor ID numbers and searching for names of companies needs to be improved for a quicker search engine. Also we have had problems with entering more than 50 line items, GP Mate has crashed. There are some really good features that we use every day and it is very user friendly. Brenda, Thank you for the review and feedback. The line number limit is a configuration setting that is in place to prevent issues with some accounting systems that GP MaTe interface with. This can be changed, but we should make sure that your financial system does not have a limit. Pros: Ease of work request entry therefore increased use by technicians. Cons: In ability to plan and schedule easily. Really hate that you can't easily build your own reports, I should be able to pick and choose information and create that report without having a third party report writer. Overall: I have used a number of systems from the old CMMS systems to SAP the biggest problem with GPMate (my version) is the ability to plan jobs in a manner useful to the technician completing the work and attaching documents and pictures. Tim, thank you for taking the time to write your review. A quick response to your comment is that GP MaTe does have an Ad hoc report writer in additional to the library of Crystal Reports reports. We need to find a way to provide some training to you and your staff in its use. I do not think any of your staff have ever invested in any formal training in the system. Comments: Overall the GP MaTe software does a good job of tracking inventory, but since it is not integrated into our Purchasing System, everything is manual entry. A fair amount of training is required. Some navigation is not intuitive. We were mainly using this on one project in Venezuela and that project was put on hold in early 2016, so we are not long actively using GP MaTe. facilitates the planning, maintenance and monitoring of inventories, it is very easy to use and makes it easier to maintain order and better performance in your work. Versatile tool for the management of an organization. Comments: Great functions - will have a positive impact on uptime. Essentional tools for trends. Tracking cost. PM module is best in industry!! Hang, thank you for taking the time to write a review. We have a new release coming out this summer that will have Vietnamese language support and improvements for adding additional charges to the PO instead of at Invoicing. Comments: GP Mate was great when we used it. Customer Support was helpful, especially when they came to the plant. Comments: As a network admin I have found GP Mate easy to manage and support. My experience with the GP Mate support staff has been great. Justin, thank you for taking the time.